The Choczewo District is located in the Kaszuby Seacoast region – in the northern part of the Pomeranian Province in the County of Wejherowo. It covers the area of 19 000 ha and consists of 31 villages 14 of which have their own village administration. Population – 6,000. The Local Government offices are located in Choczewo. The Choczewo District is the only one in the Wejherowo County with direct access to the sea /17 km of coastline/. You will be able to breathe in uncontaminated sea air with a large amount of iodine, stroll along clean beaches of Lubiatowo, Sasino-Stilo and Słajszewo and enjoy the peace and quiet of Choczewskie and Kopalińskie lakes which are picturesquely situated amidst forests and rich with fish /tenches, pikes, eels/. Both the lakes and the sea beaches have charming swimming areas and well equipped campsites, which include food and beverage facilities. Another attribute are the forests – clean and rich in forest undergrowth and teeming with mushrooms. A nature reserve established in 1961 called the “Choczewskie Cisy” [“The Yews of Choczewo”] may be found by the road from Sasino to Stilo. The object of the preservation is the renewal of yew in the natural environment of a mixed forest. Upon a high wooded dune, 1000 m from the coastline there is one of the most beautiful lighthouses in the Kaszuby region – Stilo. 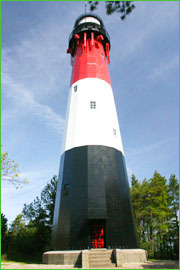 The lighthouse may be visited every year from the beginning of June to the end of August, between 10 AM to 6 PM. The undisputable tourist attributes of the district, i.e. its location and clean environment, became the basis for establishing agro-tourism farm holdings from the existing farm holdings offering the opportunity for rest and relaxation amidst nature and the possibility to taste meals made from the products grown on farms. Among the residents one can meet many folk and professional artists. The agro-tourism farms are located in Sasino, Słajszewo, Ciekocino, Choczewo, Kierzkowo, Kopalino, Lubiatowo and Gościęcino. The agro-tourism package also offers “vacation in the saddle”. The Choczewo District has an interesting and rich history dating back as far as the Middle Ages and inextricably linked with the fate of the Gdańsk Seacoast and the Lębork Land. The characteristic trait of this region is a large number of historic manors surrounded by well preserved park complexes which once belonged to well known Pomeranian families such as: Dzięcielski, Wejher, Jackowski, Łętowski, Krokowski, Przebendowski. Some of these manors, have been restored to their former glory and have opened their portals to guests and operate as holiday and leisure centres. They are: the manor in Starbienino, currently being a branch of the Kaszuby Folklore University, a small manor in Zwartowo with a Training and Vacation Centre “Relaks” and a manor in Sasino with a privately-owned hotel complex called “Pałac w Sasinie” [“the Sasino Palace”]. The restored manor in Przebendowo holds the headquarters of the Bird Migration Research Station of Gdańsk University. Historical churches may be visited in Osieki, Ciekocino and Zwartowo. The area of the district is favourable for those who want to spend their free time actively going horseback riding, mushroom picking, fishing, hunting, cycling or hiking. The Choczewo District invites tourists and guests alike to visit the area, stay and rest not only during the summer. The local climate and holiday offers may encourage tourists to pay a visit any time of the year.